Okay, back to the original post. 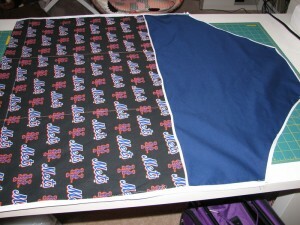 One of the gifts I made this year and had to keep secret on this blog was a Mets apron for my friend Elizabeth. But I delivered it to her the other day, so now I can post about it. 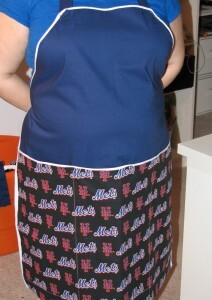 She is a rabid Mets fan and is also learning to cook, so I made an apron using the same Martha pattern. And I’ve made other aprons this holiday season with it that I will post about in the next few days. I learned something very interesting in the course of making this. Or maybe not interesting, but a random fact (librarians love random facts). MLB has stopped licensing cotton fabric with team logos. Only cotton, though; fleece is still available. Every other sport licenses cotton fabric. So I tracked down 3/4 of a precious yard from eBay to make the apron. Who knew the stuff was like gold? I’ve tweaked Martha’s pattern because it’s a little oversimplified. The comments for this apron don’t think it’s very clearly explained, and I remember it took me a while to figure it out originally. I use two fabrics wrong sides together-one for the back and one for the front. So when you fold up the fabric to make the pockets you see the back fabric. 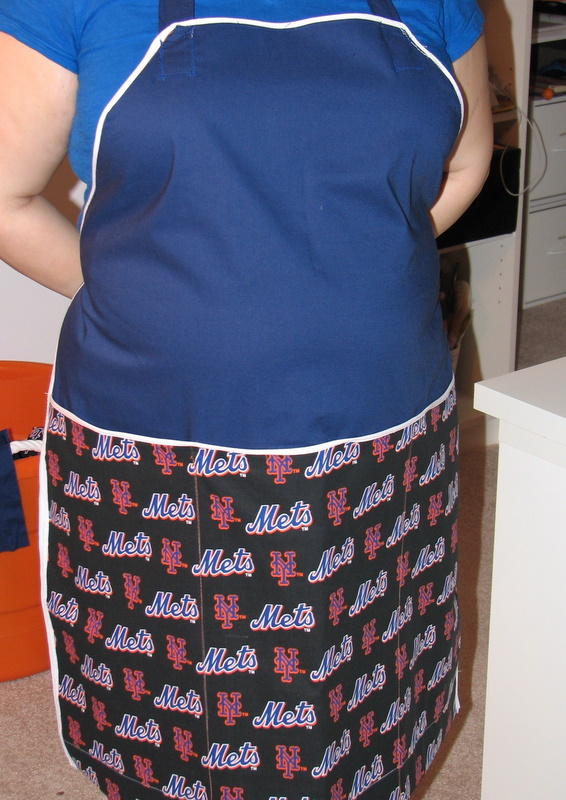 But because I only had 3/4 of a yard Mets fabric I also used bright orange for the back of the apron to finish it. It took a little maneuvering to line up the Mets fabric so it would look pretty straight on the apron front, but then I sewed it to the orange fabric to make it one back piece. Then I took a 2-yard piece of navy blue fabric for the front. 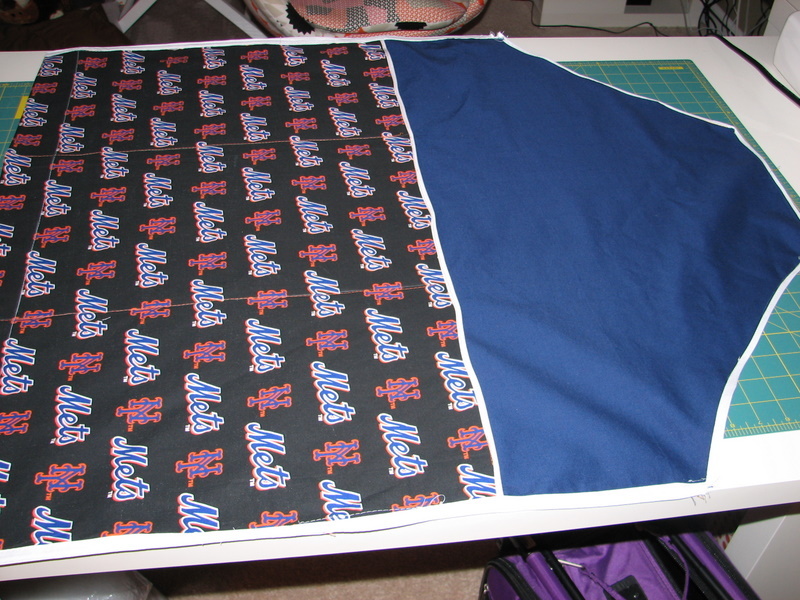 I laid them down on top of each other wrong sides facing (which was really only important here for the Mets fabric) and cut out the pattern using Martha’s template. The template is confusing because it prints out onto several pieces of regular paper. You have to cut it out, line up all the numbers, and tape it together. It’s basically one extra long apron piece folded in half, so I folded all my fabrics in half lengthwise to cut out the apron. Then you open up the pieces and pin them together. Following the directions and the markings on the pattern, I folded the bottom of the apron up to create the pocket. I pinned it and marked the pocket into thirds. Then I sewed those lines. I didn’t actually sew the back and front pieces together until I put the binding on them. 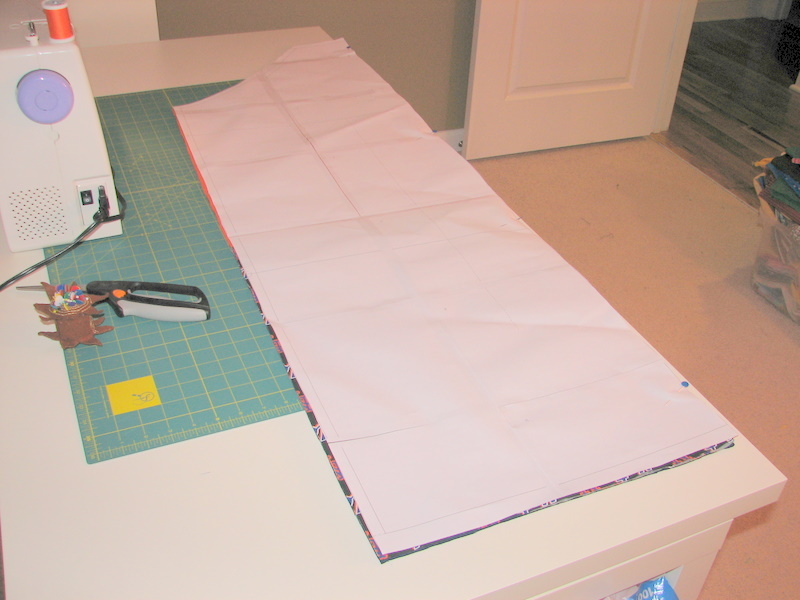 Martha’s version didn’t call for binding, but that’s how I make my versions. I bound the top of the pocket first, then I did the apron on all sides except the very bottom. I like the way this looks, and I think it’s easier. Plus I don’t think I understood exactly what to do from the original instructions, so I’ve made up my own over the years. And they work well for me. Then I cut out strips of the navy blue fabric and made all the straps. I’m happy with this. It’s easier to make with just two pieces of fabric, and the bias tape was so thin that I actually used two pieces sandwiched around the fabric. But I like it, and I think Elizabeth did, too.